The voxels defining a region-of-interest (ROI) are usually fixed during a neurofeedback run. 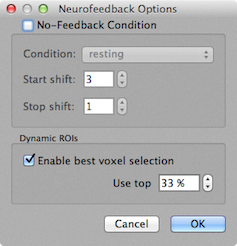 An adaptive selection of "best" voxels is available in the Neurofeedback Options dialog (see snapshot above) that can be invoked using the Options button in the lower right corner of the Neurofeedback dialog. In order to enable the dynamic selection of voxels within a defined ROI, turn on the option Enable best voxel selection in the Dynamic ROIs field. This feature allows one to define larger ROIs (e.g. based on macroanatomical (atlas) definition) and let the program automatically determine the "best voxels" within the ROI. A disadvantage for neurofeedback is that the feedback signal might fluctuate when the set of included voxels changes at arbitrary points in time. It is planned for a future release to allow changes of the ROI voxels only during baseline epochs in order to avoid this potential problem during modulation blocks. Dynamic ROIs allow to automatically select a percentage of "top" voxels from a defined ROI creating an effective sub-ROI on the fly. The Use top % field is set to a default value of 33%; you may change this value by using the up/down spin buttons or by entering a value directly. A value of 33% will select a third of the voxels of the ROI to form the optimized sub-ROI. You can observe which voxels are selected in the Multi-Slice View, or more clearly, in the zoomed Single-Slice View. Benefits. Dynamic ROIs generally lead to better signal extraction from ROIs, especially in case of coarse anatomical ROI specification. But also functional ROIs benefit from dynamic selection: By defining rather broad initial ROIs, dynamic voxel selection ensures that the best sub-ROI will be determined even if there are small alignment errors across successive runs or movement-related slice shifts. It is important that functional ROIs are defined by using somewhat lowered thresholds in localizer experiments in order to include "fringe" voxels. How are dynamic ROIs determined? The "best" voxels are selected based on the current set of condition beta values calculating a score based a) on the maximum condition beta value and b) on the amount of deviation from the mean of all condition betas. The first criterion selects those voxels, which have the largest beta value. The second criterion calculates first the mean of all betas and then adds the absolute differences of each beta value from the mean. This deviation index biases the selection to those voxels with a "irregular" profile, i.e. which will show high values for contrasts between betas. The two calculated criterion values are added to get an overall voxel score, which is finally related to the baseline signal level of a voxel, i.e. voxel-score = (b_max + b_dev)/b_constant.